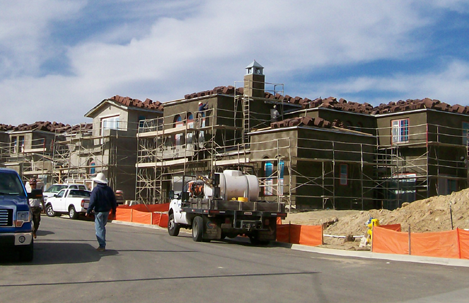 There are a variety of different types of home builders in the North San Diego County area. During the past few years and the current downtown in the housing market we have seen a number of builders both big and small leave the market due to a number of circumstances. Builders have left for reasons including bankruptcies, big builders closing divisions located in the San Diego area, lack of financing available for new construction, less land available for home building and a lengthy process for getting approvals to build new communities. Although the market is not what it used to be earlier in the decade the big builders that have been able to make the necessary internal adjustments have survived. In North County San Diego alone there are over 30 big or medium size builders actively building homes in over 80 communities. These homes are being offered for sale at prices that we saw nearly 8 years ago. Most builders do not what to be known as “production builders” with homes coming off an assembly line. They do their best through marketing and creating subtle differences in home styles in each community to make you think your home is unique and can be personalized to stand out among the many similar homes in the neighborhood even though they are working from 3 or 4 basic floor plans. With the choice of options and upgrades there can be considerable differences in the sales price of homes with the same floor plan in each community. Big home builders rely on consistent practices that allow them to build homes like an assembly line. Although they may offer numerous options and upgrades they often stray from the basic structural plans. In order to meet their tight timeline for producing each home they must conform to schedules, use proven contractors accustomed to production building and purchase materials in bulk. Many of the components in your home will be exactly as what is in all the homes in each community. The big builders have considerable financial resources; many of them are public companies and have excellent relationships with lenders and subcontractors. Because they build in quantity they have strong relationships with material suppliers and subcontractors and are able to purchase materials and contract for prices that are lower than what a small or custom builder can obtain these for. The difference between home building and any other type of production assembly is that homes don’t move down a production line with workers assembling components. Homes are stationary and the workers move from home to home repeating similar tasks on similar homes. The same skilled tradesman does not perform the same task on each house. For instance there may be a number of plumbers, electricians, carpenters, painters scattered through a construction project, many times someone who starts the work on one house may be assigned to another house or a completely different community before the work is complete and someone else completes the work. This is where a builder needs to be staffed with experienced, detailed and quality conscious Superintendents that are responsible for the construction and quality of the house and possess the skills to manage many trades. However, the big builders are not good at change. They do not like to change or customize a home plan or alter the wording on their purchase contracts. The buying process is like buying a car. You visit the showroom (upgraded furnished models) and see the variety of cars they have to offer, most of them are upgraded with many features not included in the base model. You choose your make and color and pick the features (options and upgrades) you want and purchase the car. The car dealers will offer financing through their lenders and offer extended warranties. Often you end up spending more then you wanted because you are enticed by the upgraded features. Big home builders are good at many things such as building homes that are desired in today’s market with desired features, meeting schedules and delivering your home on time while creating livable communities offering expected amenities in those communities. An advantage of buying from a big established builder is that many offer excellent warranty and customer service programs. They are easy to contact and have the resources to assist you and complete any warranty issues. As a buyer of a home from a “production builder” you only need to be concerned and assured that your house is built to the standards you expect. Unlike a custom home you will not be able to visit the construction project whenever you want so it is important to trust your builder and if you have the opportunity get to know the project superintendent.